Goop Skincare Review 2018: Ingredients, Side Effects, Detailed Review And More. 1. What is Goop Skincare? Goop Skincare is a beauty brand that focuses on developing organic products. Products under this skincare line are made with natural and safe ingredients. Luminous Melting Cleanser (75% Organic): Deeply penetrates your pores to purify it while simultaneously rehydrating your skin. Exfoliating Instant Facial (86% Organic): Tough on dead skin cells and dirt, this is made with natural exfoliators. Enriching Face Oil (99% Organic): Revitalizes, rehydrates, and reconditions your skin with a natural oil blend. Revitalizing Day Moisturizer (73% Organic): A sheer and lightweight daytime cream that floods your skin with moisture and antioxidants. Replenishing Night Cream: An overnight repair cream that heals, firms and brightens your skin. Perfecting Eye Cream: Provides moisture and repair functions suitable for your delicate eye area. Almond, Olive and Coconut Oils: These provide your skin with natural antibacterial and antiseptic properties. Shea and Cocoa Seed Butters: Deeply penetrates your skin to deliver moisture at different levels. Jojoba and Sunflower Oils: Facilitate faster skin healing and recovery from damage. Salicylic Acid and other natural alpha and beta hydroxy acids: These ingredients gently exfoliate your skin, and help in regulating your skin’s natural oils. Plant Cellulose: It penetrates yours skin deeply to aid in exfoliation functions. Vitamin B5: Also known as Panthenol, it leaves a thin film on your skin surface which traps moisture in. Helianthus Annus (Sunflower) Seed Oil: It heals your skin and facilitates skin restructuring to bette resist factors that damage it. Olea Europaea (Olive) Fruit Oil: Packed with antioxidants, this ingredient also helps restore your skin’s ideal moisture levels. Anthemis nobilis (Roman Chamomile) Flower Oil: This ingredient calms and soothes skin irritations. Linseed Extract: It provides a deep and soothing feeling that relieves skin irritations. Vitamin C and E: These re-energize your skin cells and deliver powerful antioxidants that gives your skin a more radiant and livelier complexion. 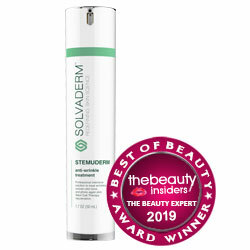 Peptides: These heal your skin by stimulating enhanced production and synthesis of skin fibers. Aloe barbadensis leaf juice: It heals and repairs your skin. Vitis vinifera (Grape) Juice: It boosts your skin’s antioxidant levels. Olive Butter: It packs in moisture and boosts antioxidant levels. Peptide: It enhances your skin’s natural repair and renewal mechanisms. These products are intended to be used together everyday and night. Use as you would any other cleanser or moisturizer. Majority of ingredients in each product are certified organic. Products are rid of toxic preservatives, including parabens and phenoxyethanol. Products under this line come with the Age-Defying Meristem Technology which heals and repairs skin damage. The line distinguishes between the daytime and nighttime moisturizing needs of your skin. Distribution channels are currently limited. These items may only be shipped to USA and Canada. The line dismally lacks sunscreen, and even its Day Moisturizer ignores sun protection. 6. Does Goop Skincare Have Any Side-Effects? Although botanical ingredients are generally safer than synthetic ingredients, some people may have developed allergies to any of the plant components. 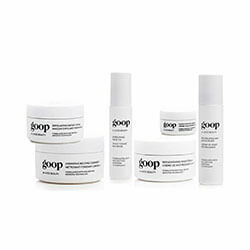 Goop Skincare provides a cleaner skincare line for a more costly price tag. Natural ingredients, on their own, have beneficial impacts on aging skin but, whether or not these are better for your skin depends on a lot of factors that includes even your personal preferences. It is best to compare with other organic brands to weigh in on this product line’s commitments. What is the Price of Goop Skincare? Luminous Melting Cleanser, $90 for 3.3 fl. oz. Exfoliating Instant Facial, $125 for 1.7 oz. Enriching Face Oil, $110 for 1 fl. oz. Revitalizing Day Moisturizer, $100 for 1.7 fl. oz. Replenishing Night Cream, $140 for 1.7 fl. oz. Perfecting Eye Cream, $90 for 0.5 fl. oz. Where to buy Goop Skincare? These products are available on the Goop Skincare shop only. Does the Goop Skincare come with money back guarantee? No, only products returned unused are qualified for refund. Is Goop Skincare approved by the FDA? These products do not require FDA approval. Who Should Use Goop Skincare? Everybody who cares about what they put on their skin should see if this skincare line fits their preferences. Should I use the Goop Skincare once or twice daily? This depends on which products are being used. How long does one bottle of Goop Skincare last? All packaging typically lasts for a month. How long will results last? Improvements stop when product use is discontinued. Can I use the Goop Skincare with makeup? Yes, you can even use the face oil on top of your makeup for a mid-day prop up.